The launch of the ‘Nostalgia’ Wedding Dresses UK Collection has been a huge sucucess with a diverse range that saw everything from slinky satin 1930’s inspired designs with Jewel detail, to full romatic gowns with lace and organza. The collection was launched in May at The Tower of London, which seemed a very fitting venue for the theme. The show was visited by all of our wonderful Stockists, we now have over 50 all over the UK and overseas, and we are very happy to say that they are selling record numbers of our gowns. Therefore Production have worked incredibly hard this year to get things out when there has been so many more orders, we are very lucky to have such a talented team. Our own shops have been as busy as ever with Knightsbridge and Cheshire creating many more one off gowns, we’ve even made one of our wedding dresses in miniature!.. This year saw a growing number of ‘Mother of the Bride’ and ‘Mother of the Groom’ outfits as Mothers should have a special dress too!. Next year will see this colletion grow, as we have already sourced some incredible fabrics including coloured lace to create beautifully delicate sleeves and necklines. Our Wilmslow store have also added a few ready to wear pieces. We were very excited to dress Tess Daly for 2 episodes and the recent Grand Final of Strictly Come Dancing. The finale dress caused quite a stirr in the press, and on twitter, and is currently in the window of our Knightsbridge store. X Factor’s winning Judge Tulisa also chose Suzanne Neville to attend the Cosmopolitain awards. Holly Willoughby wore a Suzanne Neville dress for the latest Twilight premiere ‘Breaking Dawn’, and both Stephanie Beauchamp and Katherine Jenkins have had a host of gowns designed and created especially for them. We’ve had some wonderful press in Brides Magazine, Wedding Magazine, You and Your Wedding and many other bridal and fashion publications, including Hello, OK, look and Russian Vogue. X Factor contestant Rebecca Fergusson was pictured most recently in ‘Siren Mae’ in Hello Magazine. This year also saw the launch of our Facebook and Twitter pages, you can now keep up to date by following us on @suzanneneville and liking us on Facebook, along with our Blog. 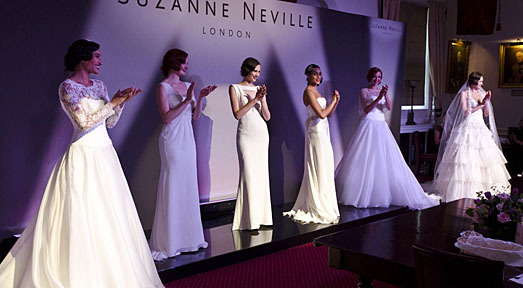 Next year we’re looking forward to creating many more gorgeous gowns, we have a few Celebrity Weddings lined up, and a new show ‘The London bridal week’ to look forward to. Along with other Bridal Designers, this is where we will launch the new 2013 collection in May.